Galway East Tourism - Athenry Heritage Centre in East Galway, West of Ireland.Galway East Tourism - Athenry Heritage Centre in East Galway, West of Ireland. Athenry Heritage Centre chronicles the story of the town of Athenry. Medieval archery and other medieval games available during the summer. Costumes available for children and adults for dressing up. School tours and groups welcome. 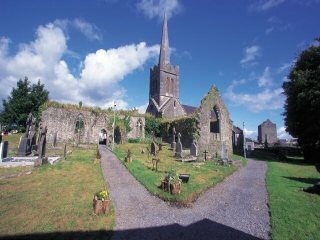 Athenry Heritage Centre chronicles the spectacular medieval history of the town of Athenry. It is an ideal starting point for exploring this 13th century walled heritage town. Medieval archery and various other medieval games are available during the summer. Medieval costumes are available for children and adults for dressing up. School tours and groups are welcome. The Athenry Arts & Heritage Center provides the ideal starting point for a tour of the town which should include the recently restored 13th Century Athenry Castle, the Dominican Priory with its interesting collection of late medieval grave slabs, St Mary's Parish Church, Market Cross, Northgate and Medieval Town Walls. Ideal for the curious visitor, tour or school outing, Athenry Arts and Heritage Center gives a clear perspective of Irelands medieval past. For information on opening times and dates please contact the Heritage Centre directly.